The left foot landing indicates the end of the jumping stride, and, simultaneously, the beginning of the next stride. When the left foot touches the ground again, the dog has completed one stride, and begins his next stride, which ends when the left foot touches the ground again. The dog has no taken two strides between the jumps. His left foot, as it leaves the ground, is beginning the jumping stride, and will touch the ground again on the other side of the second jump. And here is the illustration from her book, which I hope she doesn’t mind me posting here. Anyway, regardless of me muffing up the distances between the jumps, I think he’s doing well. He had to adjust for the double that I threw in there the second and third sessions. I think he’s ready for that, because he’s really smooth over the single jumps. And I do want him to learn how to adjust his stride and his gait for different kinds of jumps. I also ran Connor through a couple, to see how he’d do, and to try to speed him up. I used the Manner’s Minder at the end of the jumps, and Connor loves that, and was beating me to the end! Yay summer is here! I have been out of town for a really long time, most of June actually, but I am back now and training again. I need to post about my long trip. It was a lot of fun and I drove almost 6,000 miles. 🙂 But I’m glad to be home and have nice weather to train outside! 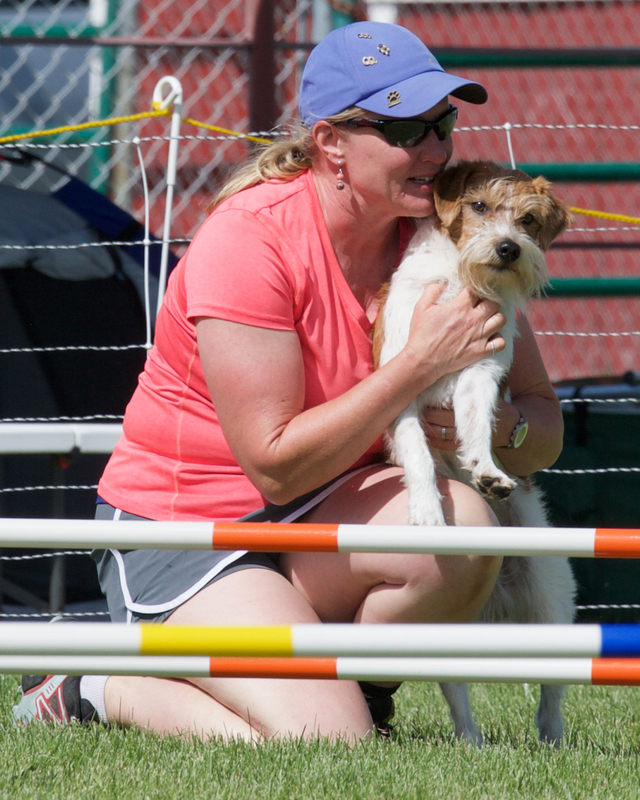 Connor has been competing in agility regularly now, and now that we are in Excellent I am seeing our issues. He is not as confident as Jet. He’s been popping his weaves consistently, and he’s lagging behind me, not driving forward like I know he can do. So I’m working obstacles and sequences to try to gain him more confidence to get him to drive ahead more and complete the weaves. I even pulled out of our July trial in order to train and hopefully build up his confidence more. Here’s my training videos of him for today and yesterday. Yesterday we worked on his jumps, and today we worked on his weaves and teeter. I’m using the push-back game to hopefully get him to drive towards the obstacles more. And I’ll do this with sequences more too. Maze and I continue to have fun learning what is best for him. Starting to train some 2×2 weaves by getting him to just go through one set. He does seem to poop out on my pretty quick… but we got some really nice throughs in! I don’t know if he stops trying because I don’t reward him with the toy if he’s wrong… or if I worked him too long. With the baby-teeter I set my watch to only work for 1 minute 30 seconds. But then I felt a bit rushed at first wanting to get so much in. LOL I am not used to setting a timer but maybe I really do need to get used to it. On the sit-stays I didn’t set a timer, just worked and saw how he did. He’s doing good with that. I had a private lesson with Julie Daniels when I was on my trip and it was awesome! I have to joke that I needed a lesson with a pro to get my dog to do a stay.. LOL, but Maze is a bit of a challenge for me, and her method works great! Did some Nosework training at home today! I wanted to work the dogs on alerts too… since they don’t really have strong alerts and I’d like them to be nice and obvious. And I know I know… UKC rules say they can’t be aggressive alerts… like a Paw… but, I’m sticking with the paw. Ya’ll can sue me. I hope it will be a gentle paw. Jet is going to do a sit or a down, whichever he prefers. Quinn has an awesome paw touch in Barn Hunt and I’m keeping that. He’s not aggressive with it, it’s just like he’s saying “Paw there it is, let’s find the next one.” Connor I’d like him to be able to really communicate to me his indicator. He needs a nice clear confident alert. Maze hasn’t done much indication… I’ve been just clicking/treating for when he’s on the odor. But I would like a nice clear indication with him too. So here are some of my other dogs’ training videos. I will probably put Maze’s training videos in posts dedicated to him. The rest of the dogs I may lump into the same posts. Either that or I’ll have just too many posts. I’ve been training almost every day. I’m retired now, and so I love to train with the dogs first thing in the morning. I clicker train. I do tell my dogs no when they do something I don’t want them to do (more in life than in training, but sometimes in training too).